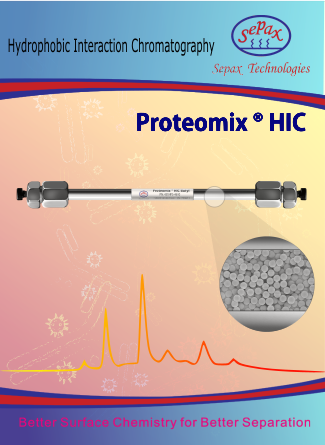 Proteomix® HIC columns are specially designed for high resolution and high efficiency separations of proteins, monoclonal antibodies (mAbs), antibody drug conjugates (ADCs), oligonucleotides and peptides via a hydrophobic interaction chromatography (HIC) mechanism. Utilizing proprietary surface technologies, Proteomix® HIC-NP resin is made of non-porous polystyrenedivinylbenzene (PS/DVB) beads with narrow-dispersed particle size distribution. As shown in figure below, the PS/DVB bead is modified with alkyl groups or aryl groups that provide hydrophobic interaction with analytes. Proteomix® HIC-NP resin is highly rigid and mechanically stable. In comparison to silica-based HIC phase media, Proteomix® HIC-NP phases have advantages for biomolecule separations with a wide pH range (2-12) and high chemical stability. The nonporous structure, unique chemistry, and narrow particle distribution offer special selectivity, high-resolution separation of proteins such as mAb, ADC and related protein fragments, DNA and oligonucleotides. Proteomix® HIC-NP media is applicable at laboratory discovery, laboratory-scale purification and preparative chromatography for the production of several milligrams to grams of proteins. Sepax also provides polymethacrylate-based Generik MC and Polar MC HIC 30 µm media which offers similar characteristics to the Proteomix® HIC-NP but is designed for process-scale applications from grams to kilograms of proteins.